The Collingbourne K9 Festival is the Biggest Little Dog Show in Wiltshire! A Companion Dog Show, with 18 Classes under KC Licence 12929. 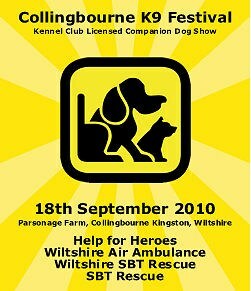 The Show will take place at Parsonage Farm, Mill Drove Collingbourne Kingston on Saturday 18 September 2010, and introduces two wonderful new trophies: "The Collingbourne K9 Perpetual Trophy" for the winner of 'Best in Show' and "The Marney Wells Perpetual Obedience Trophy" for the overall winner of the Obedience Classes. The winners of both these trophies will also receive a Canine Hamper and a £100.00 cash prize. Doors open at 08:30 a.m. for dog show registrations and the Grand Opening will be at 10 a.m by our special guest Mr Pip Pocock, of the Veterinary Hospital, Hungerford and Miss Claire Lingard the Show 'Chairman'. At 1 p.m prompt there is a Guinness World Record Attempt at the record for the "Largest Simultaneous Dog Stay" in the main arena. under Guinness World Records™ reference 303386. This record is for the greatest number of dogs who 'stay' successfully at a single venue. The current record as at today's date is: The largest simultaneous dog stay involved 627 dogs at an event called "Super Sit" organised by the RSPCA at the Wag and Bone Show, Windsor Great Park (UK) on the 6 August 2005. We think this record should come to Wiltshire and hope you will join us in helping to bring it home! Help For Heroes is the charity that does exactly what it says on the tin. As far as we know, Help For Heroes is the only charity that can say it is 110% effective - we can guarantee that for every £1 donated, £1.10 will go directly to helping wounded service men and women. So, we do exactly what we say - your donations go directly to supporting the wounded boys and girls. The Wiltshire Air Ambulance is a unique service being one of only two air ambulances in the country which work as a joint project with the local police. The Air Ambulance Appeal is entirely dependent upon public support to raise the £500,000 a year to keep the service flying. This is only a third of the running costs of the helicopter. The remaining two thirds are funded by the police who use it for various incidents. WSBTR is a voluntary organisation that does not receive any government funding. We rely solely on the donations generously provided by our supporters to rescue, rehabilitate, retrain and re-home genuine Staffordshire Bull Terriers that have been abandoned, abused or neglected or are stray dogs in council kennels. Staffordshire Bull Terrier Rescue is a voluntary organisation dedicated to providing help to Staffordshire Bull Terriers and their owners. We offer advice and information to the owners and help with re-homing dogs if necessary. Dogs are put into the rescue organisations for a number of reasons. Some are abused, abandoned, neglected or just unwanted. We also get them in rescue because the owners are genuinely unable to look after them through no fault of their own.